At first sight sporadic instrumental music, especially for keyboard, has been transmitted from the period 1470-1520, except for some manuscript collections like the Buxheimer Orgelbuch, ca 1450-1470, and the Glogauer Liederbuch, ca 1480. But on closer inspection it will appear that a considerable part of the vocal secular and religieus repertory has been transmitted without text and making only instrumental performance possible. The religious music without text consists especially of organ music, for instance the Buxheimer Orgelbuch, and after 1500 printed lute tabulatures too (see under Notation of music for the different notation systems). Non-texted vocal secular music is to be found especially in Italian manuscript sources in staff notation. A limited number of religious compositions are found in the same sources as the secular pieces likewise without text. An example is the Credo from Isaac's mass O praeclara, which is found as an instrumental piece without text, with the title La mi la sol. Religious music in other sources is never found without text, though every singer (as his modern colleague) knows the texts of the mass parts by heart. Vocal secular music in this period is found with French, Middle High German and Middle Dutch texts and some pieces in Italian. These texts were often translated from each other and provided with Latin religious texts, but they were never translated in Italian or English. The conclusion is that at least a part of the vocal music was performed on instruments, and so at least in the region from which the textless manuscripts and prints originate: from Italy, Spain and Switzerland. I included the pieces with underlined titles beneath in the page Renaissance sheet music of this site. For example: Antoine Busnois's In mijnen zin has been transmitted without text only; it may be supplemented from a later arrangement of the same melody by Alexander Agricola. Josquin des Prez made two arrangements of the same melody, with a French text, which is not a translation. The arrangement in four voices has a French text in two sources, a High German translation of the Middle Dutch text in four sources and no text at all in seven. Very popular also was Hayne van Gizeghem's De tous bien plaine, 21 sources, of which only 5 sources with text. Some thirty arrangements of these pieces have been made by numerous composers, known by name or anonymous. Some of them may have been performed with voices, but most of them are evidently for instruments only. Many pieces contain a text with one voice only, mostly the upper voice and less often the tenor or cantus firmus; the other parts must have been played by instruments. For which instruments would the secular vocal music without text have been meant? Until ca 1490 most secular music was in three voices, afterwards in four. The religious music was in four voices considerably earlier. A viol consort has been mentioned for the first time only in 1495. The British musicologist Jon Banks (see further the page Acknowledgments) argues that these pieces have been meant for a lute consort. The lute was not played as a chord instrument, but the strings were stroken one by one with a plectrum to play a melody. The structure of the pieces and the tonal compass would practically exclude all other instruments. 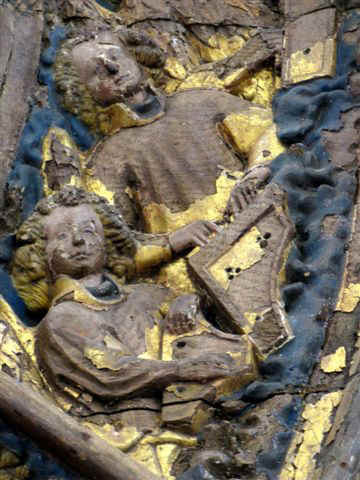 But archival and iconographic sources contain much evidence that the lutes were played in duo's, supplemented with another soft (bassa) instrument: a bowed string instrument, recorder or harp. I am sure that he underrates the compass of other instruments, especially the Ganassi type recorder with cylindrical bore, which could play two octaves and a fifth (see A.Brown in Tibia 2005/4). The harp was very popular in Italy also. The Glogauer Liederbuch has been associated with the alta cappella of shawms and brass wind instruments, but some of the pieces it contains (for instance Die Katzenpfote) agree in structure and compass with the other pieces analysed by him. Banks too easily concludes that non-texted pieces transmitted with a title have only been meant for instruments only. This especially concerns songs with a title in Middle Dutch by Jacob Obrecht, but pieces of other composers with Dutch titles disproportionally miss their text. But most manuscripts do not have their origin in the Netherlands. The text transmission of a less general language is vulnerable, and Middle Dutch was not spoken at a court after the dissolution of the Dutch speaking court at The Hague in 1433. It was spoken between the river IJssel and the line Duinkerke-Roermond. Most of Brabant, including Brussels, spoke Dutch, but the Burgundian court and administration was francophone. Hainault spoke French now as then. Ockeghem, Ghiselin, Johannes Martini, Josquin, De Orto and Lassus came from the Francophone part of the Netherlands. Busnois, Pipelare, Alexander Agricola, Barbireau, Gizeghem, Obrecht, De la Rue and possibly Isaac and Willaert from the Dutch speaking area. There is a painting by Pieter Coecke van Aelst (1502-1550) in the Museo Correr at Venice. Its subject is the Prodigal Son. The painting shows three ladies, two with a lute played as a chorrd instrument, one with a traverso and the prodigal son himself has a part book in front of him with superius part of the music and text of Obrecht's Wat willen wij metten budel spelen, ons gelt is uut (= How should we play with our poach, our money has gone). One text line more is visible but illegible. The rest of the text is lost, but the painting proves that there has been more text and that the music is not only instrumental. The Burgundian court of Charles the Bold had three "joueurs de bas instrumens" at its disposal in 1469 and four in 1474. These may have been recorders, fiddles or lutes. From ca 1490 on the secular music achieves a fourth voice. About the same time the viol consort appears. Printed lute tabulatures of polyphone music for the lute as a chord instrument date from about 1505. Banks distinguishes the following genres in the instrumental versions or arrangements of originally vocal music. 1.Chansons and rondeaus meant to be vocal but performed instrumental from the beginning. They are mostly in three voices between 1450 and 1480/1490. 2.Compositions that copy one of the voices of an existing piece, mostly the essential melody or tenor, sometimes the upper voice or superius, and construct a new composition on the existing voice. The position of the copied voice may change and the melody itself may be put an octave or more higher or lower. The rhythm of the melody is left unchanged, though it may be elongated to a cantus firmus. Sometimes the starting point is an existing (popular) song like Tandernaken upten Rhine and O Venus bant. The basse danse La Spagna is also counted among this group. These arrangements based upon one unchanged voice are generally in three voices until ca 1490. Banks calls these pieces resfacta compositions, in my opinion erroneously. The term originates from the music theoretician and composer Johannes Tinctoris, ca 1435-1511, in his alphabetical Diffinitorium musica, Naples 1474. "Resfacta idem est quod cantus compositus". "Res facta is synonymous with Cantus compositus". "Cantus compositus est ille qui per relationem notarum unius partis ad alteram multipliciter est editus qui resfacta vulgariter appellatur". "Cantus compositus is the melody which by transportation of the notes of one part to another is generated manifold, usually called res facta". In my opinion cantus compositus means polyphone music against cantus planus, one-voiced music, and res facta means composed material, against traditional or existing material, also one-voiced Gregorian plainchant or popular music. Tinctoris considers the terms to be identical. It seems better to use the older term "Cantus prius compositus", "formerly composed melody". 3.Ricercare-like pieces, sometimes with non-vocal titles like La Martinella, Ile fantasies de Josquin, Die Katzenpfote. These pieces have not been derived from a chanson or rondeau with its fixed form, but they sometimes do originate from a motet or mass part. The original melody is devided into pieces and varied. Most pieces are in three voice, but a fourth voice is sometimes added or optional. The voices of ricercare-like pieces do not imitate each other except in the beginning of a piece. The measure signature changes more often than in vocal pieces. Some pieces are very long, like Agricola's Pater meus agricola est and Caecus non judicat de coloribus. 4.Free arrangements of chansons or other instrumental pieces. The most well known are Ockeghem's Fors seulement and Gizeghems De tous biens plaine. More than 30 arrangements of both of them are known, some based upon an unchanged part, others are free adaptations. These are mostly in four or five voices. The original melody in these free arrangements is dealt with just as freely as in the ricercare-like pieces. Sometimes they contain a cantus firmus part or parts of a cantus firmus. The proportions of the notes of the cantus firmus may be equalised, causing the loss of the original rhythm. It is remarkable that the Buxheimer contains hardly any transcriptions from this period, but from the generation before (Dufaye and Binchois). Only a few works are the same as the instrumental arrangements we are considering now. Later keyboard transcriptions do contain some pieces from 1450-1520, both the original compositions and the different types of arrangement. I do not have an overall image of them and Banks does not compare the keyboard music with the other instrumental music. The harpsichord has been mentioned the first time as clavicembalum in a letter from Italy in 1397. A German named Hermann Poll is mentioned as its inventor. The oldest known image is from 1425, in a section of a circle of angel musicians around an image of St Mary in an alter piece from Minden (Lower Saxony, Germany), now in the Bodemuseum at Berlin, photograph by me, 2007. The statue is carved from lime wood and mirrorwise, presumably for artistic reasons. The keyboard is protruding forward, under the bottom of the instrument. In the same section, beneath the angel with the harpsichord there is an angel with a psaltery and above him one with a clavichord and one with an earthenware rumbling pot. A reconstruction has been made by Tom Strange, accounted for in this article. The small compass of the instrument is remarkable, only about 20 keys, and Strange chose a'-f''', agreeing with the compass (not the pitch) of an untrained human voice. Gregorian chant seldom surpasses nine notes, and angels sing very high and heavenly. The clavichord in the same altar piece has space for 12 to 16 keys, agreeing with the clavichord from 1476 in the Amsterdam Rijksmuseum only has got 16 keys and possibly space for 3 or 4 more, but it is impossible to conclude this from the photograph. Portative organs often have got only 16 pipes. The harpsichord described by Henri Arnault of Zwolle has a compass of three octaves, B-a'' (36 keys), and his clavichord reaches b'' (38 keys). The RCM clavecytherium has 40 keys from E - g'', possibly not the original design. But these instruments agree with the compass of many diatonic harps with about 20 strings. The first technical description with drawings of the harpsichord and clavichord is found in a manuscript by Henri Arnault de Zwolle (died 1466, buried at Dijon) wikipedia, a physician and mechanical engineer from the Northern Netherlands, who stayed at the court of the Duke of Burgundy at Dijon until 1454. Zwolle was a part of the principality of the bishop of Utrecht, which gradually came under the influence of the Burgundian dukes in that period. In the scientific literature he is mostly named Arnaut de Zwolle, evidently because Arnault is supposed to be his surname. According to name-giving traditions in the northern Netherlands it is, however, evident that Arnault was his fathers name, and that his actual name was Henri(cus) or Hendrik Arnolds zoon (son). Even the French sources call him Henri in the first place and never Arnau(l)t: "Henry Zwolis profeseur en medecine de monsieur le duc"; in a short biography in the manuscript he is called "Magister Henricus Arnault, medicus Alemanus de Zuuolis". The manuscript dates from c. 1440. The design of outer keys of the keyboard makes clear that parts of the keys protrude from the instrument. Henri decribes four different and very complicated actions, none of which in use after 1480. He regards the first system as the best one; the action works from the bottomside, and there are holes for the transmission device in the bottom of the body of the instrument. The actions number 2 and 3 have been placed in a sort of removable box upon the body of the instrument and work downward, number 2 by means of little chains. Number 4 is a system which strikes against the strings, actually the principle of the piano. The plectra have been made from wood or brass, there are no dampers and the strings may be double, but above each other. The compass is B-a". Clear translations of the Latin text (as far as possible) may be found in the French edition by Ed. Le Cerf (Paris 1932) and in Stewart Pollens, The early pianoforte (Cambridge 1995). The image above has been reproduced from the edition Le Cerf. Several attempts to reconstruct the actions have been made, for instance by John Lester, Chris Barlow and J.C. Monzani. Lester also gives translations, but admits that his knowledge of Latin is limited. An image of a harpsichord (not a spinet) like this can be found in the Très riches heures du duc de Berry, fo 126 r, under the main image to the right. It was made by Jean Colombe between 1485 and 1489. In at least three churches in the Swedish province of Uppland, North of Stockholm, there are pictures of a harpsichord from the same period. The vault paintings in the church of Häverö, reproduced here, have been made by Albertus Pictor ("Albert the Painter") or his school about 1480. He had a workshop at Stockholm. The image proves that also in the outskirts of European culture new musical instruments spread rapidly (photograph made by me, 2005). Another instrument described by Henri Arnault was the clavichord. It was used mostly as practising instrument by organists. It is a string instrument with a keyboard; at the ends of the keylevers are vertical brass plates which push the strings up from the downside. Sometimes a pedal keyboard was added with keys, which were attached to the manual keys with pieces of string. The oldest image is found on the same gilt wooden altar piece from Minden, 1425. Also well known is a wooden sculpture from an altar piece by Adriaen van Wesel, dating from c.1476 and made for the altar of the Lieve Vrouwe Broederschap in St. John's Cathedral at 's Hertogenbosch, now in the Rijksmuseum at Amsterdam. The tone of the harpsichord and related instruments is produced by a piece of raven's quill fixed in a jack, that is pushed up by the keylever, by its upward movement plucking the string. The quill is nowadays mostly made of plastic (delrin). The oldest surviving instrument is a harpsichord with a vertical sound board and strings, a clavecytherium. Its origin is Ulm (Southern Germany) and it dates back to c. 1480. It is now in the collection of the Royal College of Music at London. Click here for a description, image and sound clip. A painting by Geertgen tot Sint-Jans (1469/65-1488/93) in the Museum Boijmans Van Beuningen at Rotterdam, the Glorification of the Virgin Mary, dating from the same time, represents an angel playing a slightly different type of clavecytherium in the right upper corner; the sound box is on the right side, so the strings have been strung diagonally; the left hand of the angel is holding on the instrument. Next to him an angel is sitting with a stick with six bells on it. In the right down corner another angel is playing a clavichord of the same type as the one described above. (The blue stripe is the reflection of the lights of the museum room in the plexiglass). The whole painting, 21 x 27 cm, may be found here. Furthermore a number of instruments from the first half of the 16th century has been preserved, one from Southern Germany and the rest from Italy. In the second half of the century they have been joined by the Flemish instruments. The major part of their builders came from Germany. Nearly all of them settled at Antwerp. You can find photographs of the instruments a.o. on the websites of the Russell Collection at Edinburgh and the Museum für Kunst und Gewerbe at Hamburg. The main difference between harpsichord and other types is the direction of the strings in regard to the direction of the keys. The harpsichord's strings lie parallel to the keys which give the instrument the form of the grand piano. In 17th-century Antwerp the instrument was also called "steertstuck", tail piece. The word part clave- is Latin for key in its original meaning and -cimbel relates to a metal beating instrument from classical antiquity. The strings of the rectangular, trapezoidal or polygonal virginal or virginals and the rectangular "muselaer" are at a right or an oblique angle with the keys. That's why these instruments are much smaller than the harpsichord. The differences between these types regard the origin of the instrument and the position of the keyboard in or attached to its the body. These smaller instruments usually have only one stop or string choir. Judging by its name and numerous paintings the virginal originally was considered a lady's instrument. The word is derived from virgo, stem virgin-, = girl, young lady or virgin. The etymology from virga, stem virga- = twig, hook, is for linguistic reasons absolutely impossible. But the French and Dutch espinette, spinet, is indeed dirived from spina, stem spina- = thorn. These ancient instruments were of course played upon. But from the early times only a limited number of dances and songs has been transmitted in manuscripts. It was not until 1501 that the paper mill owner Ottaviano Petrucci from Fossombrone (North East of Perugia) edited the first printed music at Venice. The "great" music of that period includes one-voiced Gregorian plainchant and polyphone vocal music for liturgical purposes and religious and secular songs (motets) for non-liturgical use. Until c. 1560 polyphone works were not notated in score like today, with simultaneous parts above each other, but the parts were printed separately one after the other. They were often divided over two opposite pages. A four-voiced piece was so divided in four blocks and six voices in six blocks per double page, etc. The book could be placed on a big stand, so a choir could sing from a single book. But separate partbooks are found also, in manuscript and print. The three-voiced Glogauer Liedbuch (c. 1480) consists of three such volumes. Organists and other instrumentalists could hardly play from separate parts on double pages and not at all from partbooks. Therefore they made transcriptions for their own use or had them made. Those for the organ originate mostly from Southern Germany and environs (Buxheimer Orgelbuch, c. 1470), tabulatures of Leonhard Kleber (1521), Hans Kotter (c. 1530), Fridolin Sicher (c. 1520), and a series of Southern German manuscipts in Turin (1630). A famous series has been made by Johannes of Lublin, Poland (c. 1530). The transcriptions were often made in a combination of one staff and ciphers or (especially lutenists) a system of letters and ciphers and time signs, all of them called intavolations or tabulatures. But the notation in two staffs occurs as early as in the beginning of the 15th century. The notation in score with one voice to each staff placed above each other appears in printed editions at about 1560. Instrumentalists were expected to play from editions like this, as Frescobaldi stresses in a comment in a four-staff edition for keyboard from 1615; Bach's Kunst der Fuge (1748-1750) has also been notated in four-part score. The keyboard players applied many ornamentations in their arrangements. Long notes, wide chords and melodies with wide ranges are broken up in many short notes at shorter distances: the notes and distances become smaller and that 's why this procedure is called diminution. Diminutions were very common in Renaissance music in instrumental and vocal music and even in liturgy (though disputed and forbidden repeatedly). The way of application of this technique sometimes shows us for which instrument the transcription was meant. Sustained notes are unsuitable for a harpsichord and still less for the clavichord. Passagework above long sustained chords point to the use of an organ, and short notes, broken chords and arpeggio's in all voices are more fit for harpsichord or lute. Harpsichord also implies virginal and clavecytherium. Because the lute has a different notation system there is generally no problem in assigning given music to this instrument. But the assignment to harpsichord or organ proves to be more difficult. The tabulature of the organist Kotter sometimes is assumed to be for clavichord, but Kleber's are evidently for organ. The mentioned transcriptions do not automatically follow the original vocal pieces. They actually actually are arrangements. Arnolt Schlick published a collection of music in tablature for organ or lute and voices at Mentz (?) in 1512. The first collection of music printed in staff notation for a keyboard instrument is by Andrea Antico, Rome 1517, containing so called frottole. The title page mentions that the collection is meant "da sonare organi", but it also presents an image of a harpsichord. 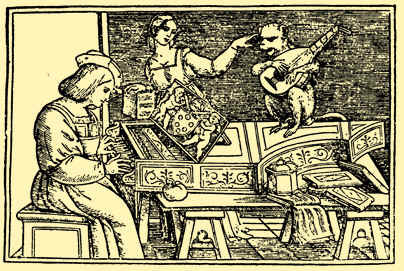 A female singer is standing behind the player and she makes a despising gesture to a monkey with a lute sitting on the cover. This presumably is a cartoon, and the monkey refers to Petrucci, see below, who had not used his license to print organ music. Petrucci had acquired this from Pope Leo X in 1513, and Antico managed to have Petrucci's license withdrawn and got his license in 1516. Petrucci had actually published many lute tabulatures. Of course both the monkey and the lute had obscene comnnotations, a good reason for the civilised lady to contempt both. The man in the picture presumably is Andrea Antico himself. The harpsichord is of the usual Italian type: the instrument is placed in a case, a construction usually called inner-outer, and it has been pulled out a little to the player. The vocal genres are distinguished by the way the text is put under the melodies, the language in which the text is written, and the context of the performance. In printed 16th-century secular music you will find the frottola, canzon (also instrumental), madrigal, chanson and (German) Lied. In the 15th century the rondeau was very popular. On the page "links" you will find one or more websites where the differences between these forms are explained in more detail. The transmitted instrumental music resembles these forms. An important new and instrumental form is the ricercar, which contains one to four rather short motives returning in different ways and different voices in one piece. Its vocal ancestor seems to be the 15th and 16th-century motet. From the second half of the 16th century on this situation changed. A new big and varied repertoire became available for harpsichord, both secular and ecclesiastical. To name the most important: the Paris music publisher Pierre Attaignant (1494-1551/1552, the editions for keyboard instruments 1529-1531), the Spanish composers Luis Venegas de Henestrosa (circa 1510-1570, edition 1557: Libro de cifra nueva, indeed in cipher notation), Antonio Cabezón (1510-1566, posthumous edition 1578) and somewhat later the English virginalists like Byrd, Philips, who transcribed vocal works by Lassus and Marenzio, and Bull (first printed edition 1612), the Dutchman Sweelinck and the Italian Frescobaldi (first printed edition 1608). Peter Philips' transcriptions are in the Fitzwilliam Virginal Book, ca 1610. Attaingnant and the Spanish composers claimed in their title pages that the works could be played on all keyboard instruments: resp. "manicordions (clavichords), espinettes (harpsichords) et orgues" and "tecla (keyboard), harp and vihuela (a kind of guitar)". The tablature of Schlick was meant for organ and lute. There was no doubt a commercial background for these claims, but that cannot be the complete story. The transcribed or arranged pieces consist of secular vocal works and all types of religious or strictly liturgical music: masses, part of the hours like Magnificat's and motets meant for liturgical or non-liturgical use. Modern editors usually assign the intabulations of masses and other liturgical music to the organ, and secular pieces to the harpsichord, but they are silent about the non-liturgic religious pieces. However, the arrangements are mostly not idiomatically written for one particular type of instrument. And in my opinion the claims in the title pages are just. Many of these works (including complete masses) are also known in lute tabulature, an instrument too feeble to be used in the large space of a church. In Spain the harp was used in the liturgical services, no doubt also because of its association with king David. About 1500 and for a long time after many churches had no organs at all. Churches which did have had one or more organs are known to have also had harpsichords, like for instance Antwerp cathedral. Gradually more and more original compositions and arrangements have gotten the special idiom of a particular keyboard instrument: organ or harpsichord. The English virginalists are conspicuous examples. But some of Sweelinck's and Frescobaldi's works are hard to assign to one of the two categories of instruments. The first music printer and publisher was Ottaviano Petrucci at Venice, later at Rome and Fossombrone, where he came from, and where he had his paper mill. The image of this site is drawn from the watermark of one of his paper frames. Some one-voice vocal music had been printed before him. Amongst his first publications belong three volumes of vocal works without text (1501-1504). The first was called Harmonice musices Odecaton A, pretended Greek for "a hundred polyphone songs, first book", the other two were Canti B and Canti C. They contained 50 and 150 pieces from the end of the 15th and the first years of the 16th century. You will find a facsimile of Odhecaton A here.The composers are the great names of the period, but a large number of anonymous pieces are included, just like pieces by further unknown composers. The parts, mostly four, are printed separately on two opposite pages, and not in score. Contrary to the organ intabulations and the later editions of Attaingnant Petrucci's editions do not contain ornamentations or diminutions. Most pieces originally had French texts. Due to the difference of accent with the Italian language it was impossible for the editor to provide Italian texts for the music and it is certain for other reasons too that this music was performed by instruments only, at least in Italy. Petrucci did not publish keyboard versions or arrangements of polyphone pieces like Attaingnant and Henestrosa. He did however publish four books with lute tabulature from polyphone music in 1507-1508. I do not know whether these works were transcriptions or arrangements. Already in 1498 he got a license to print organ music in Venice and in 1513 in Rome, but he did not make use of these, or if he did no copy survived. It is possible that he acquired the licenses only to exclude competitors from the market, but without success, see above. That 's why or nevertheless I named this site after him. At about 1520-1530 the generation of Josquin des Prez successively died (Josquin 1521, Obrecht during a plague in 1505, Pipelare, c. 1515, Isaac 1517, De la Rue 1518). Antico did not print any of their works and Attaingnant only printed a few in his keyboard arrangements. So did Henestrosa and Cabezòn. Therefore the music by Josquin's generation and his predecessors is underrepresented in printed editions. With this website I intend to fill a small part of this gap. Works dating after 1520 have been transcribed and arranged frequently, but most of them have been published in print. Therefore I did not emphasize the later period. I did include, however, three-voiced pieces by Lassus, because he did not publish instrumental music himself and a few pieces by Giovanni Gabrieli and Willaert, because they wrote idiomatic organ music only and these pieces are comfortable on harpsichord. Further more I included pieces by Sweelinck because they deserve to be more widely known. The transcribed pieces mostly have four voices. Each staff normally contains two voices. I only use the G and F signature at the normal pitch. I have respected the original scores as much as possible. I did not apply reductions or simplifications. Octave transpositions are left to the player but incidentally a proposal has been made for adaptations. Changing hands for the middle voices has not been indicated. There are no proposals for ornamentation and diminution. This means that I do not continue Attaingnant's procedures. In a later phase I will make a page which will compare different procedures of transcription and arrangement for keyboard by different editors and composers. But at first I will extend the site with new transcriptions. Some pieces are based on a so called cantus firmus, a melody in long notes, against which the other parts had been set. The cantus firmus may be played on the pedal keyboard of an organ or on a melody instrument. I included the ensemble scores of some pieces, especially adapted to recorders.